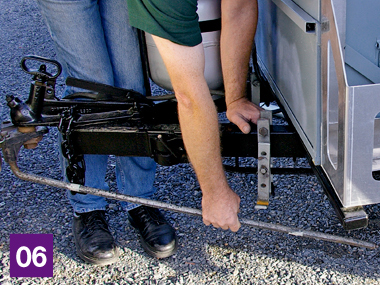 A WEIGHT DISTRIBUTION HITCH (WDH, also called level-rides or load-levellers) is often important for safe towing of caravans and trailers. When a load is placed on the rear of a vehicle, a pivoting action (like a see-saw) takes place on the rear axle of the towing vehicle. The additional weight imposed on the towball depresses the rear of the vehicle, lifting the front. 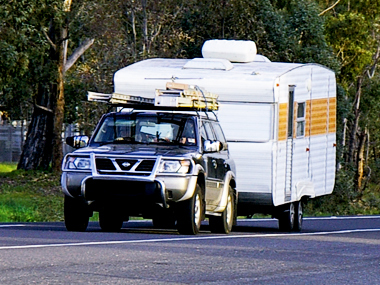 Taking weight off the front wheels can lead to poorer steering control, less effective braking, an overall loss of traction between the tyres and the road surface, point the headlights towards the sky, and may result in caravan sway. In short, it’s a bad idea. A WDH will tension the vertical movement between the tow vehicle and the caravan chassis and counteract the pivoting, returning some of the weight to the front of the tow vehicle, resulting in a safer rig. Different towball download weights call for a different WDH. 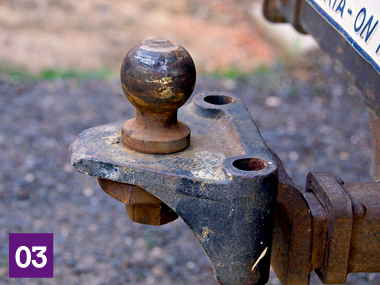 There are light-duty systems that can be used on a conventional towbar tongue by fitting a cast iron head under the towball. 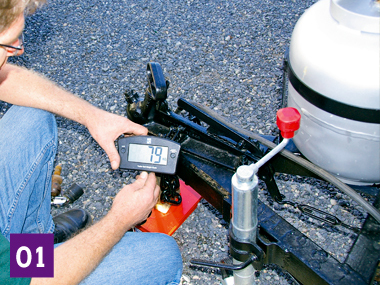 Light-duty two-bar systems suit rigs with downloads of up to approximately 80kg. For loads between 80kg and around 130kg, a four-bar WDH is necessary. 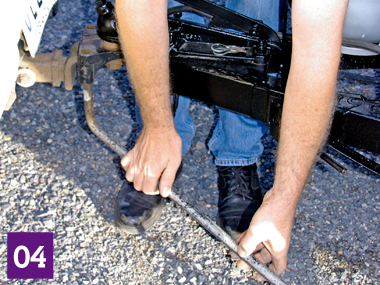 Loads of up to about 450kg require a strong, professionally fitted receiver hitch on the tow vehicle. 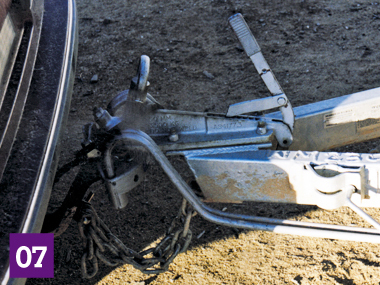 The hitch must be rated to handle both the download and the overall towed weight. There are three weight categories in the Hayman Reese heavy-duty WDH line-up: 130-150kg; 250-340kg; and 340-450kg. Having said this, fitting a WDH isn’t necessary with all tow vehicle/van combinations. The best way to determine if you need a WDH is by measuring the distance between the (level) ground and peak of the front wheel arch before imposing weight on the towbar. Once the van is hitched up, re-measure in the same spot. If the difference in the two measurements is greater than 5-10mm (when stationary), a WDH is recommended. 01 Know the download weight. Either refer to the compliance plate fixed to the van by the manufacturer, or better still (certainly if the van has goods in it), weigh the nose of the caravan. Also know the overall weight that the tow vehicle is permitted to haul and the capacity of the towbar – all loads imposed by the caravan must be within these figures. 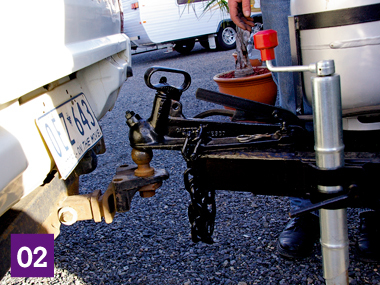 02 Back up your tow vehicle and determine if the towball is at an appropriate height for the caravan. 03 Remove the towball, place the cast iron head on the tongue and tighten the ball. 04 Fit the load leveller rod upwards into the hole in the cast iron head. 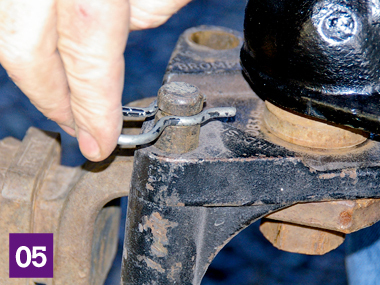 05 A circlip fits into a groove near the top of the rod. Repeat steps 4 and 5 on the other side. 07 The four-bar WDH is almost identical to the two-bar unit. If you purchase the four-bar unit it can also be used as a two-bar version, so you can manage a greater range of loads. The main differences are that the A-frame brackets accommodate two bars per side, and the cast head has four holes instead of two.